Vintage and upcycled materials are at the heart of her design process and inspire limited edition collections. Her work is experimental yet grounded in traditional techniques including Japanese braiding, sewing, embroidery, and beading. Working within the constraints of existing materials allows unexpected ideas to flourish. Designs are collaged together and further refined over time to create unique, timeless pieces. Ashley grew up in Florida and lived in Brooklyn for seven years before setting roots in Austin. Jewelry making has been a common thread throughout her life. After graduating from the University of Florida in 2006 she began experimenting with textiles, now the foundation of her work. Click here to learn more. I love tinkering and experimenting with tactile materials like fabrics. My work with textile jewelry began during college and my enthusiasm ebbed and flowed over the years. After working as a User Experience Researcher creating digital products for several years, I paid off student loans, saved some money and eventually felt ready to quit my day job to pursue my small businesses. While living in New York, I had spurts of making and selling jewelry and hair accessories at markets on the weekends; it was my creative outlet and a contrast to the digital work. Currently I'm a one lady operation and sell my work in markets and online at ashdel.etsy.com. I also run another small business online selling handmade party goods at ashdelstudio.etsy.com. Bouncing between the two businesses is good variety for me and if I get stuck or bored in one there's always something to be done in the other. Sometimes it's difficult to switch gears, and that's OK as long as deadlines are met. Taking time to get into the flow and work through new ideas in the studio is necessary, even if it doesn't feel like the best use of my time at the moment. It's important to me to keep things fresh and create new work fairly regularly. It's difficult for me to make the exact same things over and over, so I create limited collections of 30 to 40 pieces inspired by and created from a cut of fabric. Some days are more business-y like applying to markets, selling at markets, updating the website, restocking at shops, meeting with other artists, quarterly taxes, etc. Having markets scheduled on the calendar are great because they are concrete deadlines to work towards. Now that I've got a full year under my belt, I have a general sense of what needs to happen when during the day, week, or year, but it's ever evolving and I'm still honing in on what works best for me. The creative community in Austin is a huge resource and I never feel alone! Whatever I'm needing to know, I feel I can find answers. One of the best ways to learn and connect with other artists is at in-person markets. People are open to discussing what works for them including markets they've tried. Everyone is at different stages in their businesses so no matter where you're at you can find someone to talk to. #bossbabesATX has been one of the best places for centralized knowledge, for example the Maker Resource Guide and regular email round-ups. One challenge is there are so many markets in Austin and new ones are popping up all the time, so knowing about them in advance and also knowing which ones are best for your business can be difficult. There can be a lot of trial and error involved, which takes time. I wish there was a central reference point for them with short descriptions to minimize the work of researching them. The City of Austin has a lot of great resources like Small Biz Austin. I'm always learning and as soon as I feel I'm in a good rhythm, things change. Change is a given and learning to embrace it is all you can really do. One thing I learned while working in digital product design is that the faster you can fail and learn from it, the better. Software can take a long time to design and build, so prototyping ideas is a smart way to test your assumptions and you can always refine further. Selling at in-person markets is great for getting new ideas out into the world even if they aren't polished and for getting feedback from customers. Some market days are duds in terms of sales, but there's always something positive that comes from it, like advertising your work or meeting a fellow artist. Figuring which designs are the 'losers' is an opportunity to either develop the idea further, or abandon and move on. Usually if I'm true to what I like, it guides me on the 'right' path. I've made designs I haven't loved as much as others and believe that this translates into selling my work. If I don't love it, it usually doesn't sell as well as other designs. There are also designs I love and people won't respond well to them until later. It's easy to give up on an idea too soon if it doesn't sell right away but it takes patience and perseverance, and maybe even some tweaking to get right. Sometimes time of year or the type of market makes a difference in what sells when. That moment when someone discovers a one-of-a-kind piece that's perfect for them or for a loved one makes it worth it. Collaged pieces are created from a mix of traditional techniques including Japanese braiding, sewing, embroidery, and beading. 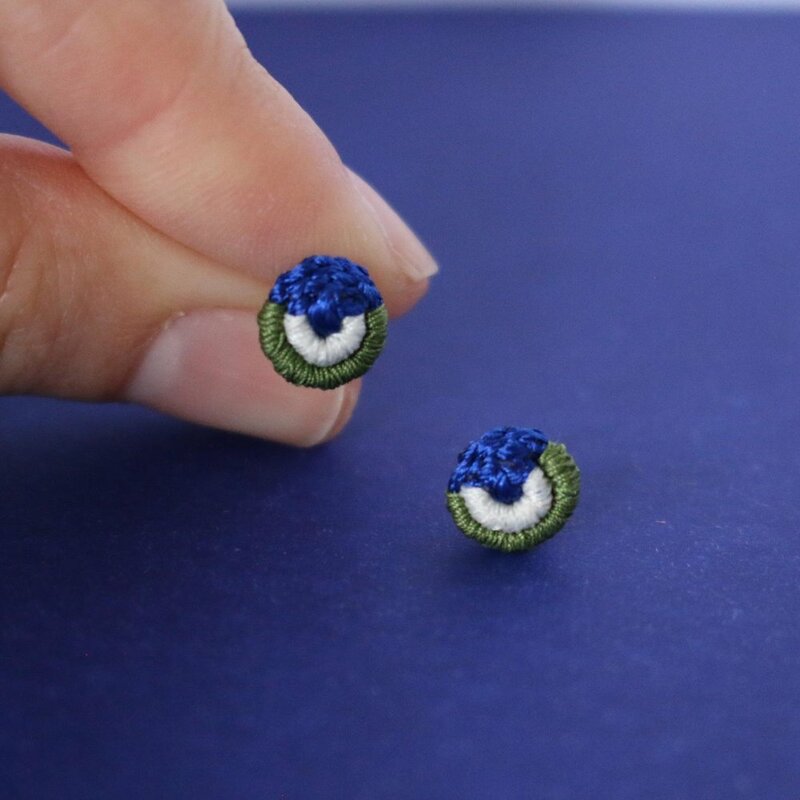 If I'm working on my woven earrings, I'll start by choosing colored threads and braid several strands in one sitting before moving onto hand sewing them into earrings. Braiding is meditative and relaxing and I work small, so the overall process is both soothing and meticulous, especially if beading is involved. Shopping for vintage fabrics is a big part of my process and inspire small batch, limited collections. I enjoy both the thrill of the hunt and rescuing fabrics and giving them a new life. I have a fairly large existing stash of fabric but also shop for supplies regularly at the Austin Creative Reuse; you never know what you'll find there. Sourcing materials locally helps keep costs down and feeds back into the local community. When I'm traveling always try to stop at antique shops to see what I can find. I believe designing within constraints helps create better designs because it forces you into different directions you may not have otherwise explored, so for me using existing materials and upcycling is a win-win. I wish I would have talked to more artists of varying business sizes to see what options are out there in terms of making a living as a small business owner. Kind of like shadowing or a day-in-the-life. For example, people who make artisanal goods vs. handmade goods with higher volume production with employees. I've been able to gather information piecemeal over time, but of course it varies for everyone. Instagram can be a blessing and a curse because you don't really know what's going on behind the scenes and it's easy to assume things. Some people are pretty great at divulging their experiences of blood, sweat, and tears, which is helpful! Would you like to meet Ashley in-person? Come out to craftHER Market on April 14, 2019 at Fair Market and stop by her booth. Click here to learn more.